Germany: Germany begins excluding Jewish students from schools. CBI - China: Day 112 of 142 of the 1st Battle of Hebei. Spain: Day 280 of 985 of the Spanish Civil War. Germany: New laws are passed requiring all properties worth more than 5,000 Reichsmarks to be registered with the government, thus prohibiting Aryan "front-ownership" of Jewish businesses. Spain: Day 645 of 985 of the Spanish Civil War. CBI - China: Day 290 of 2,987 of the 2nd Sino-Japanese War. Day 75 of 124 of the Battle of Henan. Day 30 of 39 of the Battle of Xuzhou. CBI - China: Day 655 of 2,987 of the 2nd Sino-Japanese War. Day 37 of 54 of the Battle of Nanchang. Day 3 of 35 of the Battle of Suizao. ETO - Norway: Day 14 of 63 of the Battle of Norway. The British begin to retreat toward Namsos as German troops begin surrounding their positions. The British troops defending north of Lillehammer are outflanked by mountain troops forcing them to fall back and form a new line at Tretten Gorge. CBI - China: Day 1,021 of 2,987 of the 2nd Sino-Japanese War. Day 160 of 381 of the Battle of South Guangxi. USA: Congress passes an act to increase the authorized strength of the US Navy and the US Marine Corps. ETO - UK: Day 229 of 258 of the Blitz. MTO - Greece: Day 17 of 25 of the Battle of Greece. The Luftwaffe attacks the British controlled airfields near Athens, forcing remaining RAF fighters to withdraw to Argos in the south. In all, the Luftwaffe sinks 15 Greek ships. MTO - Libya: Day 13 of 256 of the Siege of Tobruk. Australian troops raid the Axis positions surrounding Tobruk, capturing 455 Italians. Meanwhile, the Luftwaffe bombs the harbor, hitting a hospital ship. MTO - Libya: British warships bombard Tripoli again. On the return trip, the battleship HMS VALIANT hits a mine and is lightly damaged. East Africa: Day 317 of 537 of Italy's East African campaign in the lands south of Egypt. The British 1st South African Brigade captures the Camboicia Pass in Abyssinia, taking 1,200 Italian prisoners of war. CBI - China: Day 1,386 of 2,987 of the 2nd Sino-Japanese War. CBI - Thailand: Day 204 of 221 of the Franco-Thai War (Vichy France vs Thailand). Atlantic: Day 99 of 169 of Germany's Second "Happy Time," during which U-boats sink 609 Allied ships with little risk. Russian Front - North: Day 227 of 872 of the Siege of Leningrad. Russian Front - North: Day 74 of 102 of the Battle of the Demyansk Pocket, another failed attempt to break the siege at Leningrad. Russian Front - North: Day 90 of 103 of the Battle of the Kholm Pocket. Another attempt to break the siege at Leningrad. Russian Front - South: Day 175 of 248 of the Siege of Sevastopol, Crimean Peninsula. CBI - Burma: Day 130 of 164 of Japan's Invasion of Burma. British troops fall back to Meiktila. In order to continue to supply the Allies in China, India and Burma, the China Ferry Command is established to airlift essential needs over the Himalayan "Hump" route. US 10th Air Force begins evacuating military and civilian personnel to India. CBI - China: Day 1,751 of 2,987 of the 2nd Sino-Japanese War. PTO - Japan: A large number of Japanese warships are sent out to search for the carriers that had launched the Doolittle Raiders, but find nothing. PTO - Malaya: Day 63 of 357 of the Battle of Timor Island. PTO - Philippines: Day 136 of 152 of the 1st Battle of the Philippines. ETO: A British Mosquito photographs German rockets at Peenemünde, Germany, but intelligence analysts cannot yet identify the objects in the photograph. The photos taken today and tomorrow will finally make sense in June of 1944. This photograph was the first to reveal the German rockets, two A-4s (V-2s) at least thirty-eight feet long. A long object pointing out to sea from the airfield was wrongly interpreted as "a length of pipe" connected with offshore dredging operations. 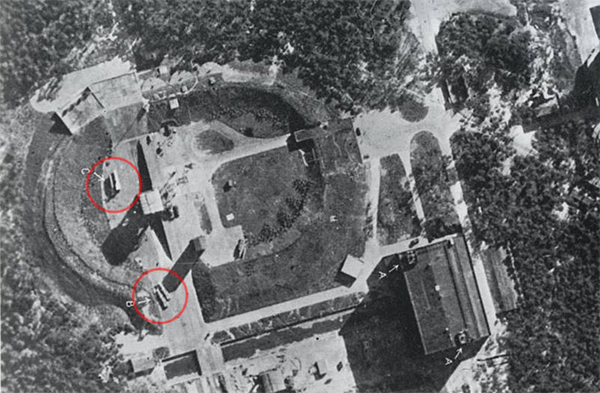 Only in December of 1943 was it realized that this structure and the adjacent one were prototype flying-bomb catapults. Germany: A transport of Jews from Westerbork Concentration Camp arrives at Theresienstadt Concentration Camp in the Sudetenland in southern Germany, formerly Czechoslovakia. Russian Front - North: Day 592 of 872 of the Siege of Leningrad. Russian Front - North: Day 353 of 658 of the Siege of the Kholm Pocket. MTO - Tunisia: Day 157 of 178 of the Battle of Tunisia. RAF and US Air Forces provide Allied air support. Operation VULCAN: British, US and Free French armies begin their final offensive to destroy the Axis bridgehead in Tunisia. CBI - Burma: Day 74 of 79 of the Allied Operation LONGCLOTH. US 10th Air Force provides air support. CBI - China: Day 2,116 of 2,987 of the 2nd Sino-Japanese War. CBI - Malaya: The submarine USS GRENADIER is scuttled by her crew after suffering severe damage from a Japanese air attack off Penang. PTO - Alaska: Day 320 of 435 of the Battle of Kiska, Aleutian Islands. PTO - Ellice Islands: US 7th Air Force B-24s night bomb the airfield on Funafuti twice. PTO - Japan: Japan announces that captured Allied pilots will be given "one way tickets to hell." PTO - Japan: The USS SCORPION sinks three sampans with gunfire off Honshu. PTO - New Guinea: Day 1 of 148 of the 2nd Battle of Lae-Salamaua. 5th Air Force provides air support. USA: Typewriters, rationed since Nov 42, are removed from rationing. ETO - France: US 9th Air Force B-26s and A-20s fly two missions against V-weapon sites in the area of Saint-Omer and Hesdin. ETO - Germany: The RAF uses the new liquid incendiary J-Bomb for the first time against Brunswick. ETO - Germany: US 8th Air Force B-17s and B-24s bomb targets at Hamm, Bonn, Soest and Koblenz. Russian Front - Finland: The USSR ends their peace talks with Finland. Russian Front - North: Day 81 of 191 of the Battle of the Narva Isthmus, Estonia. Both German and Soviet troops remain in their defensive positions. Russian Front - South: Day 15 of 35 of the Battle of the Crimea. Russian Front - South: Day 15 of 60 of the Battle of Romania, 1st Jassy Offensive. MTO - Austria: Mussolini meets with Hitler at Klessheim Castle near Salzburg. Hitler tells Mussolini to expect the Allied invasion within 6 to 8 weeks at which time he will unleash his new technical weapons that will turn London into a heap of ruins. MTO - Yugoslavia: Tito's Yugoslavian partisans storm the Adriatic island of Korcula, capturing 800 of the German defenders. MTO - Italy: Day 97 of 123 of the Battle of Monte Cassino. RAF and US Air Forces provide air support. The German Gustav Line continues getting weaker. MTO - Italy: Day 92 of 136 of the Battle of Anzio. RAF and US Air Forces provide air support. CBI - Burma: Day 49 of 166 of the UK's Operation THURSDAY. CBI - Burma: Day 44 of 147 of the Battle of Myitkyina. US 10th Air Force provides air support. CBI - Burma: Day 22 of 302 of the Chinese Salween Offensive. US 14th Air Force provides air support. CBI - China: Day 2,482 of 2,987 of the 2nd Sino-Japanese War. Day 6 of 259 of Japan's Operation ICHI-GO. Day 6 of 39 of the Battle of Central Henan, the first offensive in Japan's Operation ICHI-GO. The Japanese troops capture Zhengzhou. CBI - India: Day 46 of 118 of the Battle of Imphal-Kohima. The Japanese overrun some Anglo-Indian positions but no real progress is made. The Anglo-Indian troops attack Garrison Hill right after sundown near Kohima. CBI - Indochina: US 14th Air Force B-24s sink four freighters and a gunboat near Cap-Saint-Jacques and knock out a bridge southwest of Vinh. PTO - Marshall Islands: US 7th Air Force bombs targets in the Marshalls. PTO - New Guinea: Day 54 of 80 of the Battle of the Admiralty Islands. 5th Air Force provides air support. PTO - New Guinea: Day 217 of 219 of the Battle of Shaggy Ridge. 5th Air Force provides air support. PTO - New Guinea: Day 130 of 597 of the Battle of New Britain. US 13th Air Force provides air support. PTO - New Guinea: Day 1 of 481 of the Battle of Western New Guinea. Allied troops land on Aitape, Australian Territory of New Guinea, and at Hollandia in the Dutch New Guinea, during Operation PERSECUTION. PTO - New Guinea: The USS IOWA escorts the aircraft carriers who are striking the Japanese positions on New Guinea, Dutch East Indies. PTO - Solomon Islands: Day 174 of 295 of the Battle of the Bougainville Islands. US 13th Air Force provides air support. ETO - France: Day 267 of 284 of the Battle of Brittany. ETO - France: Day 220 of 236 of the Siege of Dunkirk. ETO - Germany: The US 1st and 9th Armies clear all German resistance in the Harz Mountains, 40 miles southwest of Magdeburg. The US 7th Army captures a bridge across the Danube. The British 2nd Army is fighting in the outskirts of Bremen. The US 3rd Army begins its drive down the Danube valley as the French 1st Army reaches Lake Constance on the Swiss/German border. Germany: Hitler ignores the pleas of his entourage and decides to stay in his bunker in Berlin to await the inevitable end. He invites Joseph Goebbels and his family to accompany him. Russian Front - Finland: Day 220 of 223 of the Lapland War. Finland and Russia have joined forces to kick the Germans out of Finland's most northern province. Russian Front - Center: Day 190 of 206 of the Battle of the Courland Pocket in Latvia. German troops continue to hold out in the port of Pillau. Russian Front - Center: Day 10 of 13 of the Battle of Zemland, East Prussia. The Polish 2nd Infantry Division captures the Sachsenhausen Concentration Camp at Oranienburg, which still has a about 3,000 prisoners. Russian Front - Center: Day 7 of 23 of the Battle of Settin-Rostock, both sides of the border between Germany and Poland. Day 1 of the 11-day Battle of Bautzen. Russian Front - Center: Day 7 of 17 of the Battle of Berlin. The Soviets penetrate into the northern and eastern suburbs. Russian Front - Center: Day 69 of 83 of the German Siege of Breslau (today Wroclaw, Poland). The Soviets continue with their siege. MTO - Italy: Day 4 of 5 of an assault by the 442nd Infantry Regiment of Nisei Japanese-Americans against German fortifications on the Gothic Line in Tuscany. MTO - Italy: Day 17 of 27 of Operation GRAPESHOT, a successful offensive in northern Italy. The Allied Air Forces hit targets in effort to hinder the supply or withdrawal of enemy troops. CBI - Burma: Day 78 of 99 of the Battle of Pakokku and Irrawaddy River operations in central Burma. The Indian 7th Division attacks Yenangyaung while Indian 5th attacks Toungoo. CBI - China: Day 2,847 of 2,987 of the 2nd Sino-Japanese War. Day 22 of 91 of the Battle of Zhijiang. US 14th Air Force provides air support. Day 14 of 60 of the Battle of West Hunan (near Zhijiang). PTO - Japan: US 20th Air Force B-29s bomb airfields at Izumi, Kushira, Miyazaki, Tomitaka and Kanoya. PTO - Japan: US 7th Air Force fighters attack Akenogahara and Suzuko airfields. PTO - Japan: Day 22 of 83 of the Battle of Okinawa. Japanese special attack aircraft sink a minesweeper and damage a number of other Allied ships off Okinawa. PTO - New Guinea: Day 482 of 597 of the Battle of New Britain. US 10th Air Force provides air support. PTO - New Guinea: Day 366 of 481 of the Battle of Western New Guinea. US 10th Air Force provides air support. PTO - Philippines: Day 185 of 299 of the 2nd Battle of the Philippines, aka the Liberation of the Philippines or the Philippines Campaign. PTO - Philippines: Day 129 of 244 of the Battle of Luzon. 5th Air Force provides air support. The Allies capture Cebu Island. PTO - Philippines: Day 44 of 159 of the Battle of Mindanao Island. 5th Air Force provides air support. PTO - Philippines: Day 36 of 135 of the Battle of the Visayas region. US 5th and 7th Air Forces provide air support. Behind-the-scenes story of the role of photo intelligence in the winning of WWII by a woman whose photo analysis was instrumental in identifying German's V-1 and V-2 weapons.